Soojipara is one of the beautiful places in Wayanad. The literal meaning of Suchi in the local language is needle. The water falls from 100 FT to 300ft heights is the uniqueness. The fall is 22 km from Kalpetta and is perhaps the most attractive one around. The three layered fall, also known as the Sentinel Rock Falls, is situated amidst thick equatorial forests and you will need to undertake a 2 km walk to reach it. Another attraction of the place is the tree top huts which will give a unique view of the valley of the western ghats. The Kanthanpara Waterfalls are comparatively smaller in both size and attraction still it makes for a popular picnic spot. This is another significant and charming waterfall at about 30 mts height.. Kanthapara falls is located towards the south east of Kalpetta. 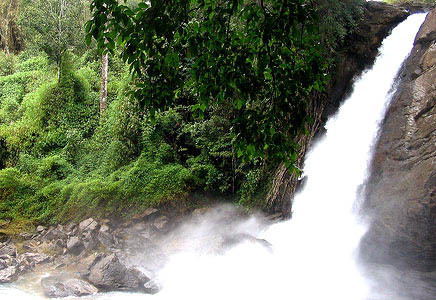 Kanthapara falls is at a distance of 22 kms from Kalpetta and 8 kms from Meppadi east.